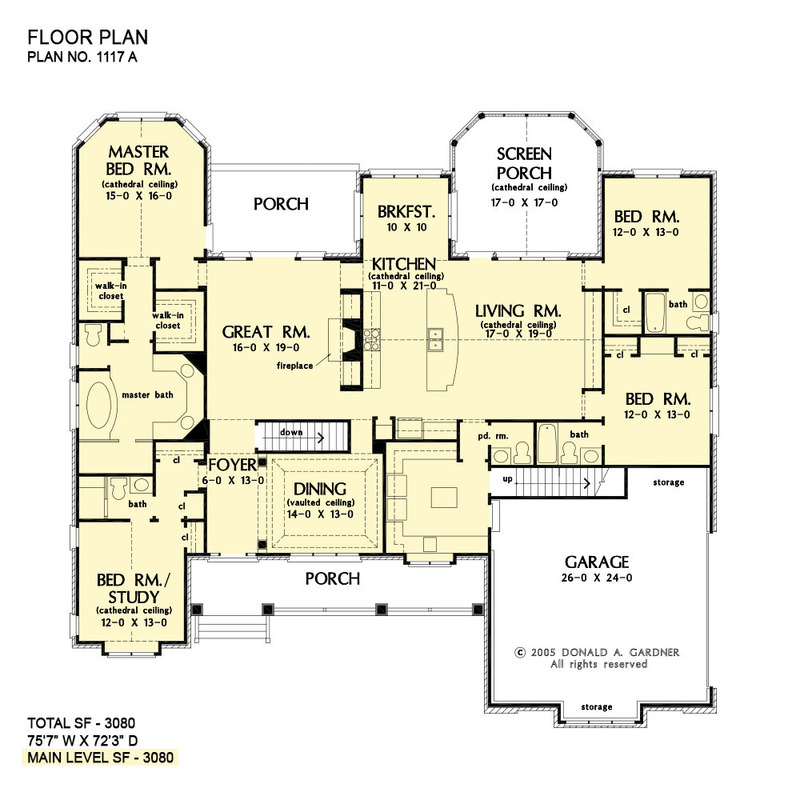 1st Floor: 3080 Sq. Ft. 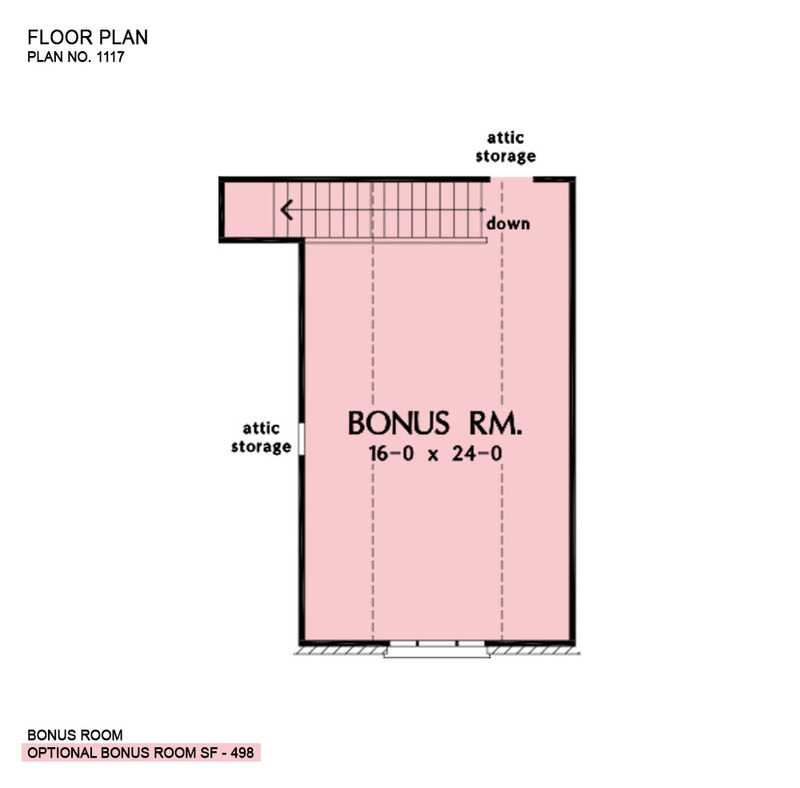 Bonus Room: 498 Sq. Ft.
Porch - Screened: 276 Sq. 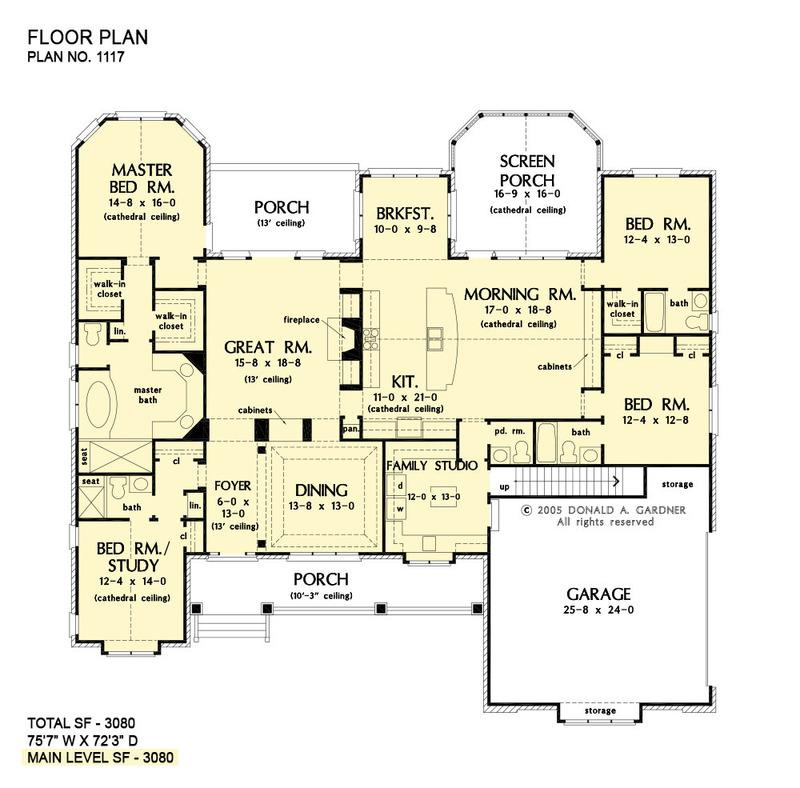 Ft.
House Dimensions: 75' 7" x 72' 3"
Great Room: 15' 8" x 18' 8"
Master Bedroom: 14' 8" x 16' 0"
Bedroom #3 : 12' 4" x 13' 0" x 9' 0"
Bedroom #4 : 12' 4" x 12' 8" x 9' 0"
Bedroom / Study (Cathedral): 12' 4" x 14' 0" x 13' 3"
Bonus Room : 16' 0" x 24' 0" x 9' 0"
Breakfast Room : 10' 0" x 9' 8" x 9' 0"
Dining Room (Tray): 13' 8" x 13' 0" x 10' 6"
Foyer : 6' 0" x 13' 0" x 13' 0"
Garage : 25' 8" x 24' 0" x 0' 0"
Garage Storage : 9' 4" x 2' 0" x 0' 0"
Great Room : 15' 8" x 18' 8" x 13' 0"
Kitchen (Cathedral): 11' 0" x 21' 0" x 19' 8"
Master Bedroom (Cathedral): 14' 8" x 16' 0" x 14' 0"
Family Studio : 12' 0" x 13' 0" x 9' 0"
Other #2 (Cathedral): 17' 0" x 18' 8" x 19' 8"
Porch - Rear : 17' 1" x 9' 8" x 13' 0"
Porch - Front : 34' 5" x 6' 7" x 10' 3"
Porch - Screen (Cathedral): 16' 9" x 16' 8" x 14' 7"
Storage (Other) : 7' 4" x 3' 8" x 0' 0"